Anyone, but there is a high incidence with people involved in active sport. Meniscal abnormalities are very common and frequently, but not always require, surgical treatment. A tear of the meniscal cartilage in a young adult usually occurs with a greater force than in a middle aged or elderly person. The reason for this is that the strength of the cartilage reduces as you grow older. With the natural aging process, the nature of the meniscus cartilage goes from being a very resilient rubbery composition to becoming more brittle and degenerate. Therefore, in a middle aged or elderly patient a cartilage tear may occur with a relatively minor injury such as rising from a chair, or a minor twisting episode. Indeed sometimes it is difficult for you to recall the exact moment at which the cartilage tear occurred, but recent vigorous activity may be relevant e.g. going on a long walk, moving furniture. Sometimes cartilage tears are associated with other injuries such as ligament tears or ruptures. When a meniscus is damaged the load sharing function of the torn meniscus is lost. This leads to increased contact pressures between the femoral and tibial articular surfaces and this in turn accelerates the wear and tear of the articulating surfaces that eventually leads to wear and tear (osteo-) arthritis. Meniscal tears cause a number of symptoms commonly causing pain and the larger and more mobile the torn piece of cartilage, the worse the pain. They also commonly cause clicking and catching sensations and can cause the knee to lock. Locking is when the cartilage jams in front of the knee and prevent straightening of the knee. This can be also associated with swelling of the joint. These symptoms are often very well localised and you may be able to put your finger on a tender area within the knee that relates to the site of the cartilage tear. The diagnosis if often clear from the history of a twisting injury and mechanical pain overlying the torn cartilage. The pain is normally worse with twisting or turning and is often associated with intermittent locking or catching and swelling. An x-ray will usually be undertaken even though a cartilage will not show up. 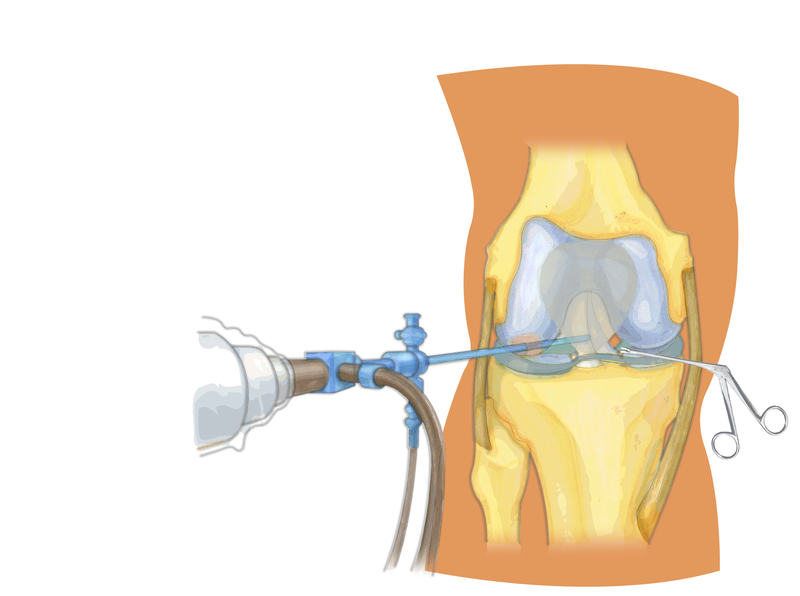 It is routinely performed to exclude other problems such as arthritis, bone injury, or loose bodies (fragments of bone) in the knee; some of which can mimic the symptoms of a cartilage tear or affect the choice of treatment. If there is any doubt then an MRI scan can be very useful to accurately determine if a meniscal cartilage is torn. In middle aged and older patients (over 50), however, the findings from an MRI scan can be less helpful. This is due to the fact that, as tissues change with age and the scan is extremely sensitive, some of the abnormalities shown may not be responsible for symptoms. Unfortunately most cartilage tears do not heal and as we get older the chances of healing reduce as the reason the cartilage tore in the first place was due to degenerative changes within it. It is therefore likely that the only treatment possibly will be surgery. Sometimes symptoms of a tear settle with time so in older adults it is often worth waiting a few weeks before considering surgical treatment. If a cartilage is torn acutely and is locked out of place, preventing the knee from fully extending, then arthroscopic surgery (keyhole) should be performed as soon as possible in order to remove or repair the torn meniscus and allow the knee to fully straighten. Likewise, when symptoms persist, with pain, intermittent locking, catching and/or swelling arthroscopic surgery to remove the torn portion of the meniscal cartilage can be performed. This greatly improves or resolves the symptoms in the majority of patients. Cartilage tears in young patients can have the potential to heal if repaired; this preserves the load distributing function of the meniscus, reducing the development or rate of progression of articular cartilage damage (“wear and tear”). However, the majority of meniscal cartilage tears occur as part of the degenerative “wear and tear” process that can progress to frank osteoarthritis. Unfortunately most meniscal cartilage tears will not heal even if they can be repaired and most require leaving surgery to remove the damaged portion as the best means of relieving persistent symptoms. Arthroscopic knee surgery is usually performed as a day case under general or regional anaesthetic and takes between 20 and 40 minutes. Depending on the nature of the cartilage tear, it will either have to be repaired, or trimmed to a smooth edge (a partial meniscectomy). Some meniscal tears are suitable for repair. If a tear is treated soon after it occurs and the tear itself lies in the outer part of the meniscus, where there are tiny blood vessels, it may be suitable for repair with special sutures or anchors. Please note that in general this is only considered in the relatively younger age group for a number of technical reasons which will be explained during the consultation and diagnosis process. More commonly the torn part has to be removed, which more commonly is referred to as a partial meniscectomy. This is done using special small punches and cutters via one of the portals (keyhole incisions) at arthroscopy. The amount of cartilage removed depends on the size of the tear. As little as possible will usually be taken out, trying to leave a smooth stable edge of cartilage and preventing any further symptoms. Sometimes, a cleavage tear (a type of splitting tear within the substance of the cartilage usually found in degenerate cartilages) can be associated with a meniscal cyst. This can be painful in itself and may present as a small lump on the outside of the knee. Cysts on the outer (lateral) side of the knee are more common than those on the inner (medial) aspect of the knee. Usually these cysts can be drained into the knee at the time of meniscectomy. Rarely, they may require removal with a bigger cut through the skin directly over the swelling. Surgery is used to relieve symptoms and does not accelerate or prevent the development of any arthritic changes as the torn part of the meniscus is not providing any useful function and if anything the torn meniscal fragment might cause further damage to the joint surface cartilage. Most patients are able to return home on the same day as surgery or the following day. All patients will need someone to take them home and be with them on the night following surgery. For most patients undergoing meniscal cartilage surgery, where a damaged cartilage is trimmed (partial menisectomy), there is no reason to specifically restrict function other than to be guided by how the knee feels. Most patients who drive a car should be able to recommence this activity within 24-48 hours of the operation if they feel safe and confident to do so. Unless the surgeon advises otherwise it is important that patients build up their level of activity as soon as possible, accepting a little discomfort for a few weeks after surgery. Again, unless the surgeon advises otherwise, patients cannot cause any permananent damage by “doing too much too soon”. Most patients can be back at work within a week and back at the gym within two. Occasionally, however, during the recovery phase, patients describe their progress as “ 2 steps forwards, 1 step back”. The important thing is to keep up the exercises and take simple painkillers and inflammatory medication if necessary. When patients undergo meniscal repair the post-operative rehabilitation is slower as the repair needs to be protected from excessive forces whilst it is healing; new tissue needs to form and strengthen across the tear before it is subjected to full force. Most patients will need to use crutches for a period of 2 to 6 weeks. You may also need to use a knee brace to restrict the range of movement for up to six weeks following surgery.All patients are guided, with the help of a physiotherapist, through a rehabilitation program that is tailored to you and depend on the size and nature of your tear. Patients undergoing meniscal repair should not do deep squats or twisting sports for 3 months. The large bandage around the knee is normally removed 24-48 hours after surgery and a tubigrip can be applied to supply gentle compression to reduce post-operative swelling. Waterproof dressings cover the small “keyhole” scars. When you can walk without crutches or a limp and be in control of your vehicle (about 3-4 weeks). Repair of a torn meniscus will lead to it healing in approximately 70% of cases. Unfortunately approximately 30% of repairs will not heal and for these patients if they have persistent symptoms then a further arthroscopy is required to remove the torn portion of the mensicus. Whilst the procedure is safe, as with any surgery, there are always a number of risks that need to be considered. Infection, which can occur with any operation. Special precautions are taken during surgery to diminish this risk, however, the risk still exists but there is <1% chance of developing a serious infection (major wound breakdown, septic arthritis or osteomyelitis). Deep vein thrombosis / Pulmonary embolus (DVT/PE) (blood clots) can also occur as with all operations (<0.2% of a serious clot). This does pose a definite but miniscule risk to life (<1:10000).